WE LOVE NO OTHER, SO LET OUR MOTTO BE VICTORY. A former (2005) "sexiest man alive" is headed for a new job: A seat on the University of Illinois board of trustees. * Would you like to be on an Illinois board or commission? You can nominate yourself online. Good luck. HOTEL WRIGLEY. The Cubs&apos; owners say they are close to a deal to put a hotel across the street from Wrigley Field -- now site of a McDonald&apos;s (which would also be be part of a new development). But there&apos;s a big "if": The plan hinges on public money to help upgrade Wrigley Field. &apos;SIMPERING CRAP SHOULD BE ELIMINATED FROM THE SPORTS PAGES.&apos; Deadspin&apos;s editor-in-chief tells the story behind the story of Notre Dame linebacker Manti Te&apos;o&apos;s nonexistent dead girlfriend (or is it "dead nonexistent girlfriend"?) and offers his take on the state of sports journalism. * Media critic Jack Shafer&apos;s prescription for becoming a better journalist: "Doubt what you read, doubt what you hear -- and when you feel your heart beating, tear it out and stomp on it until it stops." * Chicago Tribune standards editor: After "embarrassing" chapter, "we will do what we do after every error: Admit our mistake, learn from it, do some soul-searching and move forward." * Washington Post suspends bureau chief for plagiarism. LANCE ARMSTRONG TELLS ... Oh, who really cares now that we have Te&apos;o? Here&apos;s a roundup of late-night show Armstrong jokes. Here&apos;s The Onion&apos;s take. And here&apos;s an animated GIF history of confessions to Oprah Winfrey. 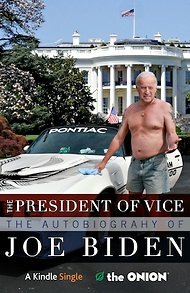 JOE BIDEN&apos;S AUTOBIOGRAPHY. NOT. The Onion&apos;s written one for him. Compare and contrast to the real thing. YOUR NEWS QUIZ IS READY. Study up first by reviewing this blog&apos;s postings over the last week. The guy who created the thing got only 90 percent. (What is Te&apos;o&apos;s nonexistent dead girlfriend&apos;s name again?) Then, it&apos;s your turn. P.S. It&apos;s an open-book (or is that open-browser?) quiz. Take WBEZ Meyerson News Quiz No. 2 right now! No blog entry Monday, Martin Luther King Jr. Day. Back here Tuesday morning. Take the extra time to email your thoughts on how the WBEZ Meyerson blog customer satisfaction team can better meet your needs.